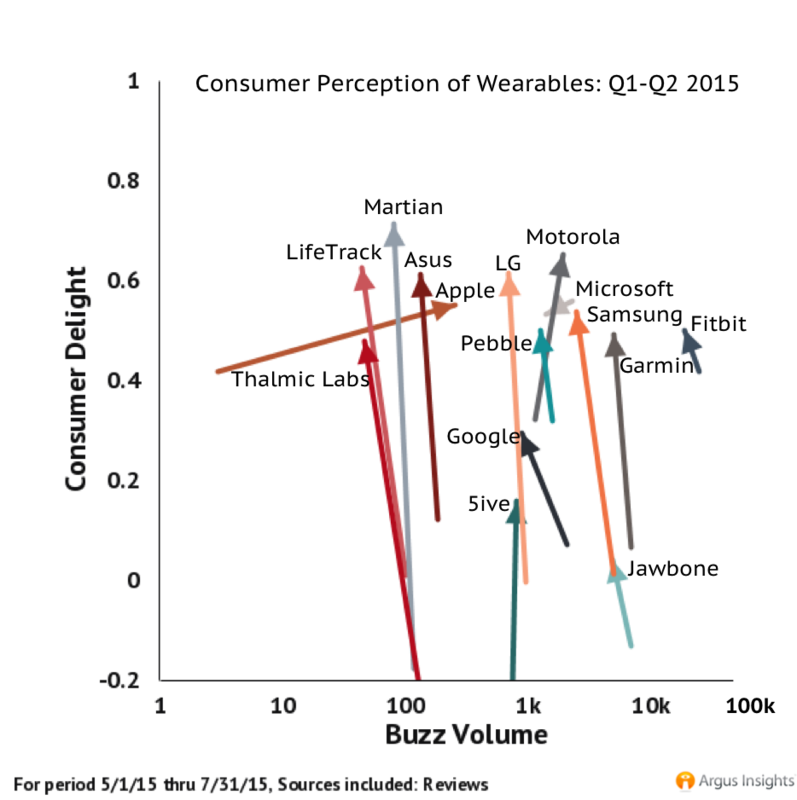 Demand in the wearables market continues to drop throughout the summer months, as well known and less popular manufactures alike are seeing less consumer feedback. Fitbit still holds the crown as the most popular wearables brand, but the trend of brands with less attention receiving higher praise persists. Fitbit remains the most buzz-worthy wearables brand, with several consumers providing feedback particularly for their Charge and Charge HR bands. Despite all the attention, however, Fitbit users are reporting less satisfaction with these products across almost all of the brand’s devices. Jawbone comes in behind Fitbit as the second most popular brand of the month, though consumers continue to rank Jawbone wearables as some of their least favorite on the market. In terms of delight, Motorola maintained a good ratio of attention and positivity as consumer reviews for the Moto 360 remained rather consistent this month, ranking the brand amongst the most delightful yet again. LG slightly edged out Motorola in terms of delight with an influx in positivity for the already well liked LG Watch Urbane. The Apple Watch beat out both of these round smartwatches with a surge in delighted consumers. Apple Watch users are becoming happier as Apple works to make the device more widely available by nixing mandatory appointments and stocking the shelves of Best Buy. While the Apple Watch does not see as many consumer reviews (due to policy restrictions), Amazon consumers are growing increasingly satisfied, so it will be interesting to see if customers who buy their Apple Watch at Best Buy will feel the same way. Consumer demand continues to slow during the summer months. Fitbit and Samsung are seeing less attention as consumers provide more feedback for the Apple Watch. While Motorola and LG continue to make their users smile, the Apple Watch surpassed these consistently well rated brands in terms of delight as more users provide feedback for the smartwatch. Apple is making their smartwatch more accessible by allowing consumers to test the product outside the walls of the Apple Store and eliminating the constrictions of appointments. Apple is currently producing some of the most satisfied wearables consumers, and their plan to increase supply will likely help them continue this trend. Will Apple’s new retail strategies lure in more customers? Subscribe to our monthly Wearables Heartbeat Report to find out. Contact us for for a free brand audit to discover how your company or technology is performing in the rapidly changing wearables market. Sign up for our free weekly newsletter for regular market updates. Fitbit Q2 Revenue Surged, but Profits Fell: Will their investment in the future be worth it? Since becoming a publicly traded company in June of this year, Fitbit has seen an increase in sales and revenue. However, after announcing their impressive earnings for Q2, their stock prices “plunged 14% in trading.” While Fitbit’s revenue beat forecasts, their profit slipped year to year due to increased spending on research and development. Spending money to make money, as Fitibt is doing by tripling their R&D spending, could have potentially spooked investors. Stepping back to take a look at the entire wearables market, we see that Fitbit’s bid toward the future is probably a good idea. While Fitbit maintains the most mindshare in the wearables market, other fitness bands, smartwatches, and less common types of wearable technology are becoming more prevalent, and Fitbit must continue to innovate if they want to keep their users interested. Currently, wearables consumers are finding more delight with products from other brands, meaning there are better liked wearables brands out there just waiting for the consumer base to take notice. 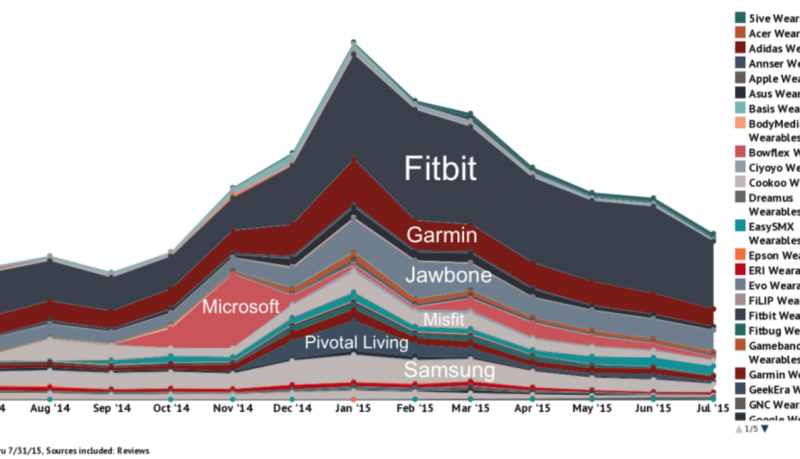 Fitbit continues to dominate the wearables market in terms of mindshare. They see far more feedback from consumers than any other brand, but Fibit consumers are far from the happiest. 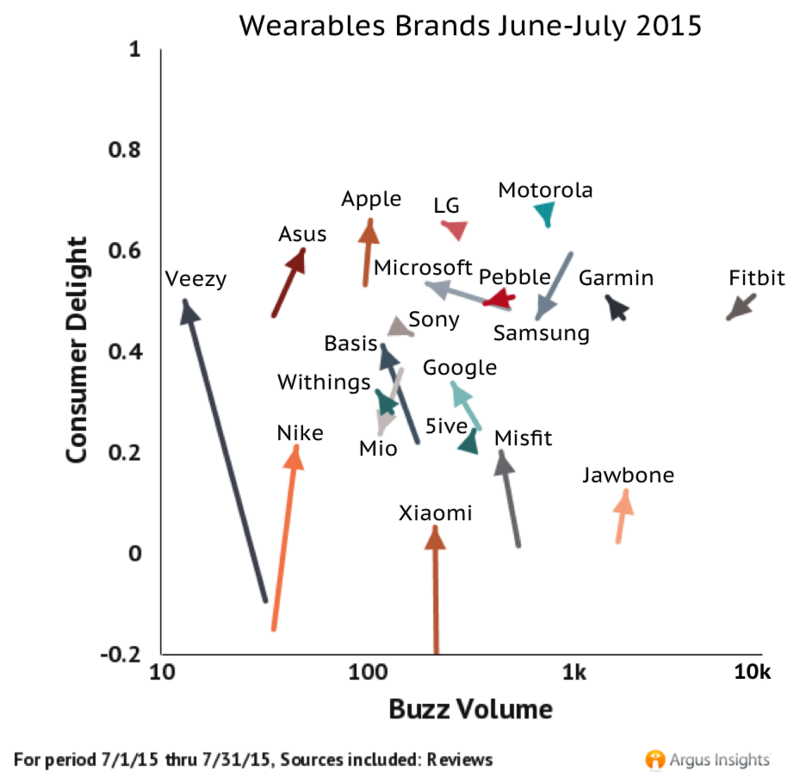 As demonstrated in the graph above, several brands saw a dramatic increase in consumer delight during Q2. Major established competitors Motorola, LG, and Samsung all saw an increase in positive feedback from consumers to surpass Fitbit in terms of delight, as did several less popular wearables manufacturers like Martian and Asus. In addition to competition from those increasingly delightful brands, as more consumer get their hands on the Apple Watch, a much anticipated smartwatch with fitness capabilities, they are reporting higher delight than Fitbit users. Consumers know about Fitbit. They buy Fitbit devices and are satisfied, but recently, consumers are branching out to find delight in other brands. If Fitbit is to maintain their prowess, they must continue to innovate, and increasing their current spending on research and development could help them compete with the increasing delight of Motorola and LG. 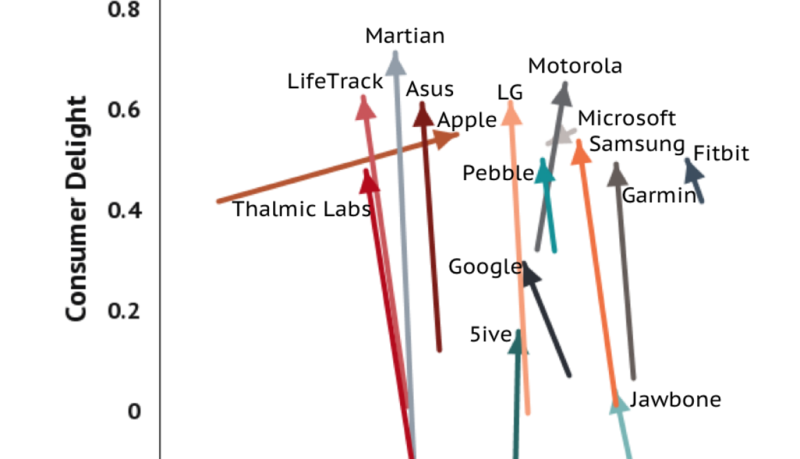 Argus Insights is constantly tracking shifts in consumer perception in the wearables market, sign up for our free weekly newsletter for regular insights, or schedule a time to talk with us about the performance of your company compared to your competition. The fight for dominance in the Chinese smartphone market is more intense than ever. Chinese manufactures are selling feature packed phones for cheap prices, and as a result, winning the customers that were once flocking to Samsung. PC World reported that Xiaomi secured 15.9 percent of the Chinese smartphone market while Huawei had 15.7, leaving Apple in third place from April to Jun, 2015. These market share reports left Samsung out of the top three vendors, despite their launch of the flagship Galaxy S6. As local vendors offer a variety of cheaper options the Chinese smartphone market is broadening as consumers explore their options, but which brands do Chinese consumers actually like? 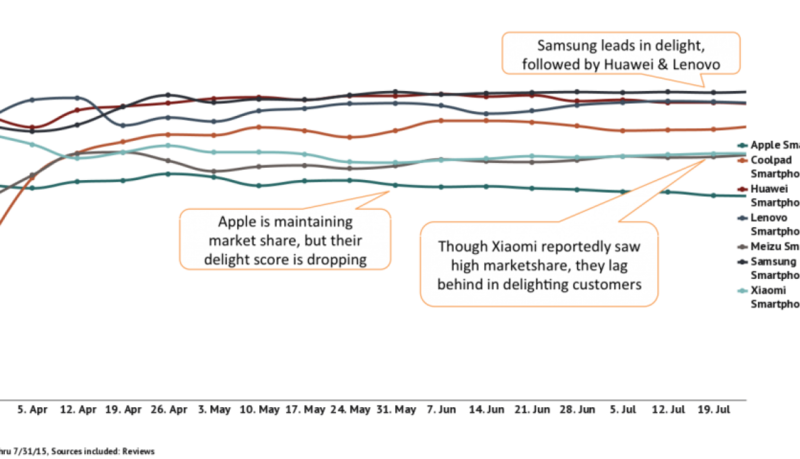 Though PC World reported that Xiaomi “regained its position as China’s leading smartphone vendor” in terms of market share, looking to delight (as calculated by analysis of consumer reviews from a major Chinese carrier) it is clear that Chinese consumers favor handsets from other brands. Samsung smartphones are consistently delighting consumers, despite the brand’s decline in attention. Huawei and Lenovo follow Samsung as the most well liked brands, leaving Huawei in a most favorable position. Huawei reportedly secured 15.7 percent of the Chinese smartphone market share and is currently receiving some of the most positive feedback from their users. As local brands expand their offerings of cheaper handsets in the Chinese smartphone market, Samsung is losing attention, but customers continue to be delighted by their high end phones. Huawei is the brand to watch, as they are gaining attention, profits, and delight with increasing popularity of their higher end devices. Want to know more about consumer perception in the Smartphone market? Sign up for our free weekly newsletter, or schedule a time to talk with our analysts.